In the 17th century, the Tantric mystic Pema Deje Rolpa was born to a revered Tertön, or discoverer of visionary treasures, named Tertön Rigzin Shiney Dorje and his consort Sangyum Kyimotso. Recognized as the reincarnation of the highly accomplished Tantric master, Ripa Pawo Tinley Dorje, Pema Deje Rolpa spent years following in the footsteps of his predecessor, wandering in solitude from one power place to another. As spiritual realizations dawned within him, his realization and spiritual accomplishments became widely acclaimed. He became simply known as “The Ripa Lama”; ri meaning mountain and pa, dweller, or “the one who dwells in mountain solitudes”. Pema Deje Rolpa made the wilderness his companion and as his biography notes; “He took air for his food and dressed in clouds”. Carefree and fearlessly awake, the Ripa Lama was ultimately inspired to benefit countless beings by sharing his profound spiritual experience. Guided in a vision by Padmasambava, Pema Deje Rolpa journeyed to a valley inTibet’s eastern province of Kham called Nyima Puk, the “Valley of the Sun”. In that exalted setting, he witnessed dragons- symbols of power, grace and magic- rising into the sky with resounding roars. With this auspicious sign, he laid the foundation of “Rigon Tashi Choeling”, which became the main seat of the Ripa lineage in Tibet. 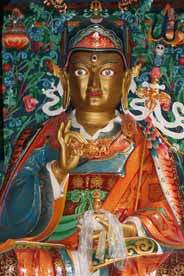 In the beginning of the 19th century, Jigme Tsewang Chokdup, the 5th Ripa lineage holder, fulfilled a prophecy made by Padmasambhava by marrying a highly accomplished yogini named Sangyum Palden Tsomo, the granddaughter of Drubwang Shakya Shri, one of Tibet’s greatest living saints. Their union brought a powerful spiritual potency to the Ripa tradition, and further established its commitment to encouraging high spiritual attainments among the non-monastic community. It also led to the birth of the present Ripa throne holder, His Eminence Namkha Drimed Rabjam Rinpoche, a living Tertön who has discovered and codified volumes of hidden spiritual treasures. In brief, the Ripa lineage of revealed treasures represents a unique system that combines the monastic virtues based on the Buddhist Sutras with highly developed Tantric skills that bring forth a profound spiritual awakening or awareness that is yet direct and easily accessible. The methods of the Ripa lineage are based on the capacity and capabilities of each individual being for reaching higher spiritual attainments. This vision became the hallmark of the Ripa lineage. The Ripa lineage developed during the lives of successive hereditary masters. In Tibet, the tradition flourished until the Chinese invasion with more than 500 monks and nuns in residence at Rigon Tashi Choeling and a community of tens of thousands of lay practitioners and supporters. An equal number of wild animals mingled freely amongst the monastic centers, retreat places, and caves. The main practices of the Ripa tradition are based on the Taksham Terma cycle of revealed teachings and the new cycle of H.E. Namkha Drimed Rabjam Rinpoche’s own visionary revelations. The New Treasures Project in Nepal seeks to restore, preserve, practice, and share this unique tradition, and is named after the original lineage seat in Tibet: “Rigon Tashi Choeling – Tibet”.